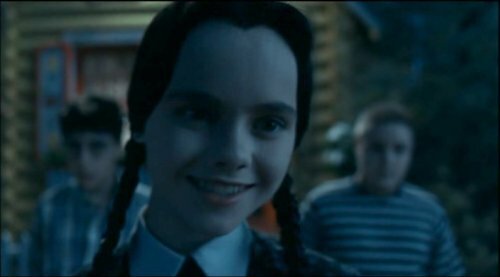 Yes, she's a fictional character, but Wednesday Addams, eldest daughter of the Addams family, influenced many young people. This deadpan prepubescent is a charming, or at least interesting, antidote to shiny, happy pop culture. (That means you, Hannah Montana!) Many proto-goths grew up fascinated with her look, though you'd be surprised how many "normal" looking people adored her as children or adolescents. Originally, the Addams Family was a group of nameless figures in Charles Addams's one-panel New Yorker cartoons. Morticia, Pugsley, Gomez and Wednesday Addams were only named when Addams created the 1960s sitcom . The character Wednesday was named after the nursery rhyme "Wednesday's Child," which states that children born on Wednesday are "full of woe" and have "far to go." Her middle name is Friday, I'm not sure why. 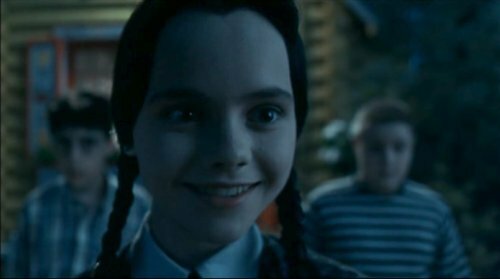 In the sitcom, Wednesday was six years old, and though she had certain macabre habits (like having pet spiders, for example) she was by no means homicidal or even deadpan, just...a little strange. She also seemed to possess superstrength, although she did not use it to hurt anyone save her father. In a 1977 TV movie, Lisa Loring played an adult Wednesday Addams, who entertains party guests on her flute, and can "hear and understand coded help messages by bound-up members of the family, and dispatch help to free them." If the movie's twice as good as it sounds, it's one more film I won't be seeing. 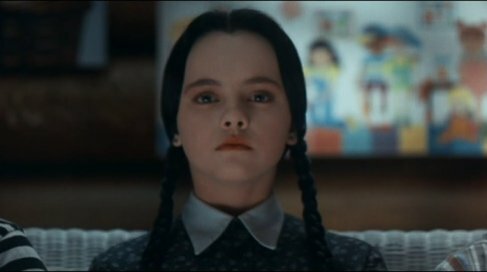 Christina Ricci played Wednesday in The Addams Family and Addams Family Values , when she was eleven and thirteen years old, respectively. Ricci's deadpan delivery, doll-like features, and extremely pale skin made her perfect for the role. It was Ricci, more than any other actress, who popularized Wednesday Addams and inhabited the character. Wednesday's most famous outfit is a knee-length black dress, with a pointed white collar and white cuffs. The dress is also, sometimes, ankle-length, or with a printed pattern whose dominant color is black. Her black hair is usually braided in two long, skinny braids, with no bangs. Black tights and ankle-length boots complete this look. Very American gothic. Do not smile unless you have a good reason, like a death or a natural disaster. 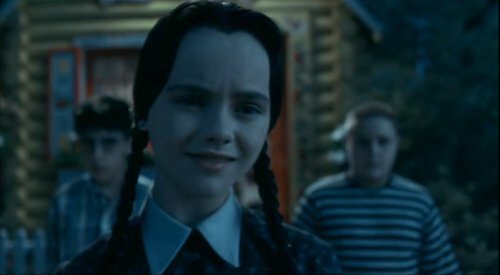 Unlike her mother, Wednesday's style is very easy to copy or play off of, although you do need the right attitude. It's one of the most low-maintenance goth looks I know of. Of course, you have to have long hair, or at least a convincing wig. You will need an old-fashioned, long-sleeved dress, preferably with a high neckline and a dark print. If this dress is vintage, consider having it tailored to better fit your body. If it doesn't have a pointed white collar and cuffs, add them (or have them added when you get it tailored). Wear black tights and black boots or shoes. Wear makeup that makes your skin look pale. Subtle orange or coral lipstick optional. Wait, who doesn't want to look like that? Screenshots from Addams Family and Addams Family Values copyright Paramount Pictures. Using screenshots, for the purpose of commentary or criticism, is considered fair use in the United States. Browse our articles on goth fashion and culture.